my name is Vinzent, I'm a new user of Affinity Publisher and I' sorry, that my English is not that good! 1. When I place a "Black and White-image" into a picture frame and create a Pdf, that "Black and White-Picture" then has been changed into a 4-Color-Image! Please give me a hint to solve that problem! 2. After marking text-elements from a WORD_Document and placing it by "Cut and Paste" into a text frame, this text will not change into the same "Text-frame-attributs"
(Size, Typo etc.) of the Affinity text frame! I hope, you will understand my problems and so I'm looking forward to your aid!!! Don't worry, when printing, your image will print as black and white (albeit 'maybe' a colour cast of magenta slightly) depending on how you print it. If it has the RGB ICC profile attached these seperate channels are now colour-less, is this what you are concerned about? A true black and white image will print better if it is converted first to a grey Gamma 2.2 profile before editing, OR, edit in the RGB colour-less channels and then convert to a grey gamma 2.2. Does this answer any questions? Just realised. You said 4 colour, do you mean that you have a cmyk profile attached? Can you describe your actions when you export to PDF? What does the 'Resource manager' say about this image? This could likely be due to the fact that 'Formatting Attributes' have been carried over into affinity, this is the word processors's own hidden codings that tell how the doc is formatted and saved and keeps it formatted within its own piece of software. Copy and paste is the worst thing to do from a word document. You need to create a TEXT doc in PLAIN TEXT and UNFORMATTED, if you must, copy and paste into this text doc then copy and paste from this into publisher, you will have to format the text and type etc inside affinity Publisher. This is normal. Hope I have answered you accurately. first many thanks for your promt reply. Give me please a littele time ton translate correctly and to understand and to try out what you suggested. After marking text-elements from a WORD_Document and placing it by "Cut and Paste" into a text frame, this text will not change into the same "Text-frame-attributs"
Look for a Paste without Format option in the Edit menu instead of doing a simple Paste. Because of the lack of English-Kowledge it will take some time to come to understand (or not???) your suggestion on my first question. This I will do later! I interprete your hint to take over Text from WORD to PUBLISHER in this way, that in the end I will have to change the preferred attributs in Affinity anyway!? WORD-text and transferred it into its own attributes (that I created before). When this not possible with Affinity Publisher yet, I have to accept it, hoping for later versions! I had to take over 20 pages of text from In-Design some weeks ago. This is what I did: Copied all the text to a TEXT editor, ths will have a .TXT extension. Make sure that the TEXT EDITOR has the format of 'PLAIN TEXT', NOT Rich text Format. Save it. I then copied paragraphs and blocks of text from this to the clipboard. Then from the clipboard into text frames in Publisher. It sounds like a lot of work. BUT, I did it very quickly, 15 minutes and all 20 pages formatted in Publisher exactly as I wanted. IMPORTANT, if you are using windows the TEXT editor is called NOTEPAD. I had to take over 20 pages of text from In-Design some weeks ago. I hope you are aware of the fact that if you copy the text from inDesign to the clipboard you can then paste it directly into the Publisher text frame. As a bonus you get all the text styles you defined in inDesign pasted into the Publisher too. Well, yes, but I was moving everything from a Mac to a Windows 10. Thanks for all your advices! Moving Text from InDesign to Publisher make no problems. What I want is to place a text from WORD into a Publisher-textframe via clipboard. When done, this text should change into the allignments of the Publisher-text frame. For example: My WORD-text is Helvetica 10pt and my Affinity-Textframe has the allignment Times 12pt. After the placing of my WORD-text this text shoult have the attribut Times 12pt! You need to create a (paragraph)text style first. Paste the text and when still in text frame tool >choose the correct text style from the paragraph drop down. Another problem!!! All my text copied into a Publisher textframe is not only Black but 4-coloured. But of course flowing text should be one-coloured, black and overprinting! HELP!!!!! Make sure that the text frame you are copying text to has not been modified in any way. What you should try to do is to create a new text frame, then click on the Revert Defaults button and then paste the text into that frame. You should be good to go from there. After the placing of my WORD-text this text shoult have the attribut Times 12pt! If you don't want the styles from Word to carry over you should use Edit > Paste without formatting. unfortunately I don't come to an end with your hints in relation to my problems with the 'Black and Wite'- Images. Here I try it to explain it in a more understandeable way. My original image is a '4-colour-picture' (RGB). I converted this Picture via Photoshop in a 'Black and White'-picture (grey-gradient mode). So this image contains of one chanel. My desire now is, to place this picture to Affinity Publisher just as it is (only black). But each time I ty to transfer to Affinity, the result of that image after creating a PDF is a 4-colour (CMYK)-image!!! That cannot depend on the attitudes of Adobe Adrobat pro, because when I make a PDF with the same picture with InDesign, everything's OK. I'm very desperated!!! succeded too, but your method is great. So, many thanks to all the nice fellows who spent their time to help me. Now I can begin solvin the other problem (placing a Black and White-Image without changing into a '4- or 3-colour picture depending on CMYK or RGB). I hope you to have some further good Advices for that Problem! As far as I know, a grayscale image will always convert to a 4-color CMYK image unless one exports to PDF entirely as gray scale or changes the Document Setup to be Gray/8 (8-bit grayscale). the result of that image after creating a PDF is a 4-colour (CMYK)-image!!! This could likely be the problem Go to OUTPUT in PDF. Check the tab: NO COLOUR CONVERSION, If you see convert to destination, you may automatically see in the next box a CMYK such as US WEBCOATED swop V or something similar. The key here is DO NOT CONVERT in the colour conversion menu. Have a look and let me know. It is most likely your colour conversion policy. No. You are likely writing about InDesign. Affinity applications, including Affinity Publisher, are not color space agnostic as is ID/QXP. In APub, the choice is either CMYK or RGB. That's it. APub should be color space agnostic (and I would argue AD ought to be as well). This is especially important for PDF/X-4, but is also useful for other PDF types that do not force CMYK. But it's not. Actually I was writing about exporting from photoshop as PDF. Trouble now is that I really do not understand his problem, I can take B/W images from photoshop into affinity Pub, export as PDF and they are still B/W. I'm lost as to exactly what it is the OP is he describing?? What on earth exactly is the issue here?? If as you say Affinity is colour space agnostic, never heard that description before, please clarify what you mean? (A greyscale image can be exported as RGB because TECHNICALLY a greyscale image still has THREE channels regardless of it being B/W. All B/W images are essentially composed of three channels R, G and B, this is a basic concept, all that has happened is that colour information has been removed from each channel). Even if you see only one channel (depending on how you converted to B/W), it is still composed of the three. Are you saying that the B/W image in the PDF exported by Publisher is truly B/W (would print using only black ink) or that it looks B/W to the eye? Actually I was writing about exporting from photoshop as PDF. RE: Photoshop & ID (and AI). Same difference as they all share the same color management. Trouble now is that I really do not understand his problem, I can take B/W images from photoshop into affinity Pub, export as PDF and they are still B/W. Upload a PDF exported from APub, please. And do not export as a grayscale PDF. Have your document color space as RGB or CMYK. If as you say Affinity is colour space agnostic, never heard that description before, please clarify what you mean? No, you read that wrongly. Affinity applications are not color agnostic. All images no matter the color space of the image will be converted and exported in the document color space or what is set during export (if different than the document color space). InDesign et al are color space agnostic. This simply means that there is no true document color space. Any/all conversions take place at export only unless one chooses No Conversion (which is the default for a PDF/X-4 PDF). So in the screen shot below, while all the images maintain their appearance as "gray" only one image on that PDF page actually is grayscale. If I inspect that PDF, every single image is using the color space embedded in the image (what image is what is written the captions). I'm lost as to exactly what it is the OP is he describing?? What on earth exactly is the issue here?? Affinity applications cannot do this. But this is what the OP desires. Again, those images are, left to right, an RGB image, a grayscale image (which only uses the K plate), a LAB image and ending with a CMYK image. Only the top right image meets the criteria of the OP (or any professional layout application). 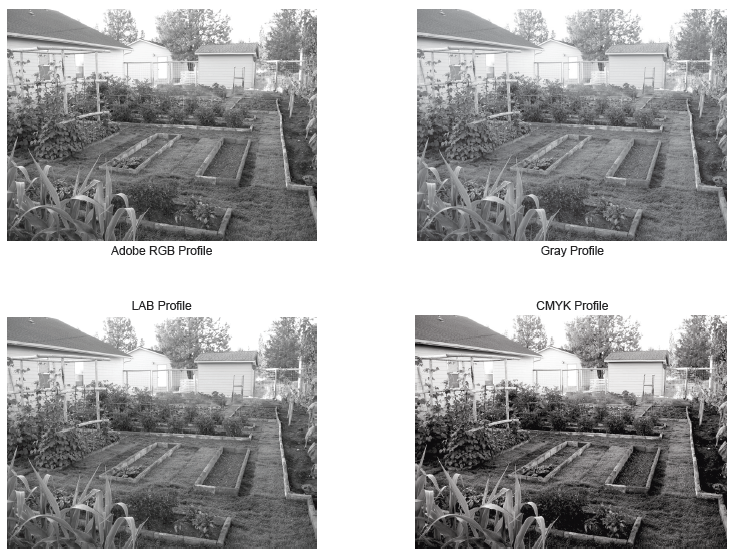 In Affinity Publisher, those 3 images that are not the grayscale image could as easily have been in full color, or there be colored elements on the page, but the grayscale image would have remained as a grayscale image—and that is something Affinity products cannot do (unless I don't know the secret handshake). Hi Walt, I have to make it clear that I have never dealt with cmyk nor used it as a profile, nor do I understnd exctly how an out-sourced printer deals with black, I do not design so I have no idea what is meant by references to rich black and the other blacks that I have causally read about. But what i have done is printed with a home printer that has 6 colours and three blacks, I send it as an RGB adobe or if my editing is done in Gamma 2.2 to the printer and I get beautiful prints without any colour casts that are sometimes associated with even 6 ink printers, because when there is only one black ink, there has to be colour inks added to make a B/W print, but with three black inks you get a truly B/W image. No, surely the final print from the pdf is dependent upon the profile attached? And the Printer that is printing it, right? Hallo Mike, I placed a black and white image that has a gamma 2.2 ICC profile attached. I placed it into publisher doc that had the adobe rgb colour space then exported as Print PDF in the adobe rgb colour space. Opened the pdf, what am I supposed to be seeing? I see a black and white image that will print as black and white and actually I have printed this image. What am I supposed to be looking for? I must be darn stupid here and missing the obvious that everyone else seems to be having aproblem with except me. ...Opened the pdf, what am I supposed to be seeing? I see a black and white image that will print as black and white and actually I have printed this image. What am I supposed to be looking for? I must be darn stupid here and missing the obvious that everyone else seems to be having aproblem with except me. Please upload a sample PDF made the way you describe. Here you are Mike. Just noticed after uploading that it has an EXE etension. That is strange since this is a PDF I use Foxit PDF's for all work. I do not understand why this has an exe extension. Upon trying to download this myself back again from this web site, I get an unrcognised app notice. Will have to look into this. It's not a PDF. You did upload the Foxit Portable reader.